Ekene Maduka’s practice is grounded in materializing her thought processes and creating opportunities for encounters with her personal experiences through self-representation. Much of her work is informed by the passages of identity and what initiates changes within it. 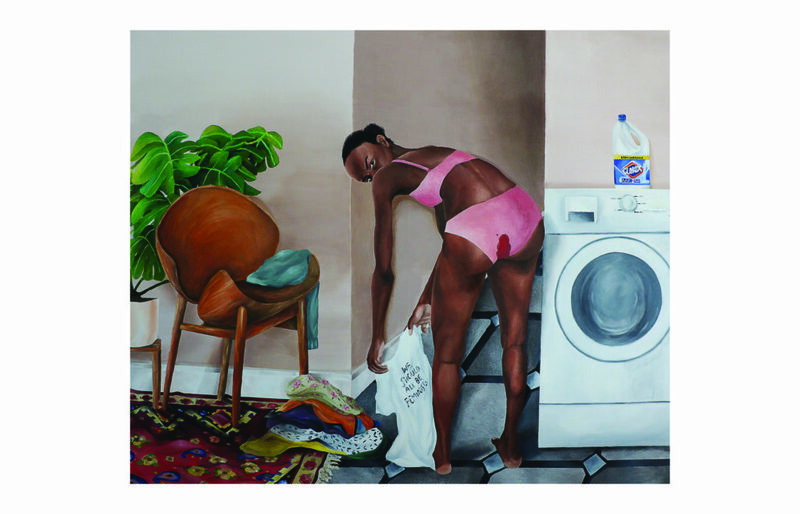 Maduka’s work is centred on the female figure, creating tension between art historical tropes surrounding the depiction of black women, self representation, and popular culture. She frequently employs heavy detailing when rendering skin, fabrics, and interior spaces. This and her deployment of pattern and striking colors carry historical as well as cultural significance that heightens the social critique often present in her paintings. In 2017, Maduka was curated into the aceartinc. student exhibition and subsequently awarded the Scott Wachal Memorial Bursary. As part of this, recipients are invited to give a public talk about their work. We hope you can join us to hear Ekene Maduka talk about her practice and recent bodies of work. This bursary is available to art students who have been curated into the Annual Student Exhibition. The bursary is intended to support a project or an opportunity (such as a workshop or residency) that will positively impact the artist’s practice. In 2013 the youngest artist curated into our Annual Student Exhibition passed away. In his memory aceartinc. created the Scott Wachal Memorial Student Bursary.